I think this is realistic because I have seen farmers before doing the same work as this book. I have seen farmers in Los Angeles and México. First sentence: Once there was a farmer who lived in Mexico. He lived in a little village, in a house which had only one room.Premise/plot: Pablo's father, a farmer, is always, always saying nothing EVER happens on their farm, in their village. Every day is the same: dull and predictable. But one day SOMETHING happens, and Pablo witnesses it all. The two are in their field plowing when suddenly a VOLCANO begins to form. What started as crack in the ground soon becomes a big volcano--an erupting volcano. From the moment "it" appears--the crack-soon-to-be-a-volcano--Pablo runs to warn the villagers. It isn't long before the villagers are fleeing the village for safety. Indeed the whole village will have to be relocated and rebuilt. This is a nonfiction early reader set in Mexico in 1943. A father and son truly witnessed the formation of a new volcano. That is far from an ordinary occurrence. The author's note states that human eyes--so far as we know from records--have only witnessed two such events. (Paricutin in Mexico and Tenerife in the Canary Islands.) My thoughts: I remembered this book from Reading Rainbow. I'm not sure I ever read it myself until I found it in my local charity shop. Even though it was not in the best shape--a discarded library copy from Connecticut of all places--I knew I had to have it. The story was just as absorbing as I remembered it. Definitely recommended. Reason for Reading: Ds read aloud to me for his reader.This book never fails to stun kids, the first time they read/hear it. How can a volcano just grow like that? It seems utterly amazing. But this is based on a true story and the volcano really did appear in a farmer's cornfield and bury the village with lava and ash.Written in a simple, easy to understand narrative, from the point of view of the farmer's son Pablo. This is a truly unique story that is sure to please any child, even those who don't usually like non-fiction. The illustrations are ok. We weren't too pleased with the depiction of the erupting volcano as it wasn't realistic enough and my son kept asking what's that?, what's happening there? and it was just that the illustrations didn't show the *how* of it very well. A diagram at this point would have been appreciated. Fortunately, I was able to explain and illustrate with my hands to his satisfaction. Otherwise, a very entertaining book. The Volcano is called Paricutin and it, along with the abandoned village, may be visited today. Based on a true story, a farmer in a small Mexican village wishes that something would happen to change his dull, routine life. One day, while plowing his field, his plow sinks deep into the earth. A loud growling noise and steam erupts from the hole. As the farmer and other townspeople watch, lava flows from the earth and a mountain forms where the town used to be. Lewis does a nice job to telling the story of El Monstruo- The Monster. We were both fascinated by this simple book about a volcano being born in a farmer's field. Ack - the horror of "starting a volcano" with your own plow! Very intriguing way to start a lesson on volcanos. This book is partly responsible for me becoming a geologist. 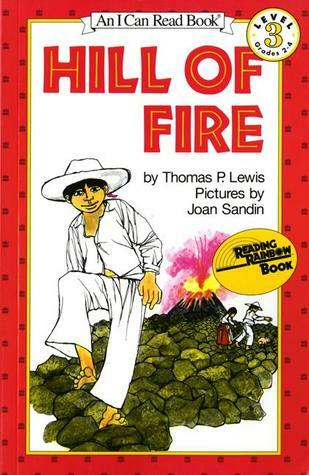 One of my earliest memories is watching a Reading Rainbow episode where they featured this book, and it got me absolutely fascinated with volcanoes. If that's not a reason for a five star review, I don't know what is. THis is great book. A learning adventure about volcanoes and a true story. Children will be amazed at what volcanic action can do and amused that a sleepy little town could have so much excitement and shocking change. Intriguing lesson in geology. An okay story about a volcano that erupts in a corn field. This was not a favorite of my daughter. An excellent book for older (9-11 year old) reluctant readers. After reading the book, you and your child should take a look at the photo gallery of the Paricutin Volcano on Wikipedia. The book was just great, and I hate to give any Reading Rainbow book under 3 stars. But somehow I never clicked with this book. However, I loved the episode. Volcanoes are fascinating! Cool that this is based on a true story. An I can read book. Slow start to the book but ends good. According to my mom, this is the first book I read by myself. Because of that, special place in my heart. A simple little reader about the birth of a volcano and how it affected the nearby village.